Fawn looking up at doe. During the spotted fawn stage, doe and fawn were almost inseparable, except when the fawn was hidden in the high grass. All photos by Steve and Kathy Callan. 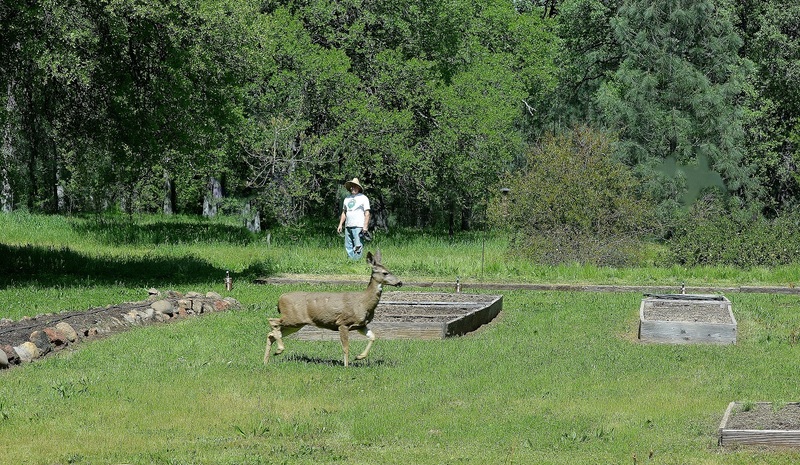 During the thirty-plus years Kathy and I have lived in the foothills east of Redding, we’ve been treated to occasional visits from black-tailed deer. They generally don’t stay long -- a day or two -- then they move on. Sometimes they’ll pay us a visit at night while we’re sleeping. The next morning, a trail of partially eaten plants tells the tale. Kathy and I offer a smorgasbord of tasty morsels for our friends to choose from: black oak leaves; blue oak leaves; acorns; native redbud and elderberry leaves; pear, pomegranate, and Lady Banks rose foliage; and whatever vegetables we happen to be cultivating at the time. I’ve found that they are especially fond of tomatoes -- green ones, red ones, and, of course, the plant itself. They also enjoy squash, cantaloupe, and watermelon. Because deer favor plants in the rose family, Kathy and I found a way to satisfy their voracious appetites and provide cover for quail and other wildlife at the same time. We planted Lady Banks rose bushes throughout the back and front yards years ago. These plants grow quite large, so deer can eat their fill without causing any harm. 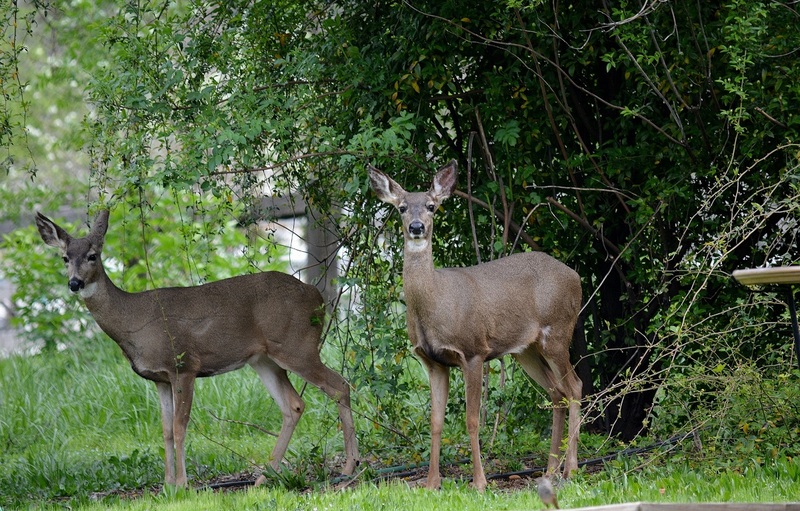 Please don’t get me wrong: I do discourage deer from pillaging our garden, but it’s not the end of the world if one snatches a tomato off the vine or pops open a cantaloupe. After all, the deer were here first, and it’s because of our love for wildlife that Kathy and I moved to the country in the first place. Last March, we were delighted when two healthy does appeared in our backyard. The larger and more mature of the two would often stand on her hind legs, browsing on freshly sprouted black oak leaves. The girls must have felt right at home, because unlike their predecessors, they lingered all spring and into early summer. As the weather grew warmer, they developed a daily routine: In the morning they’d drink from the many water dishes spread around the yard and browse on Lady Banks rose. 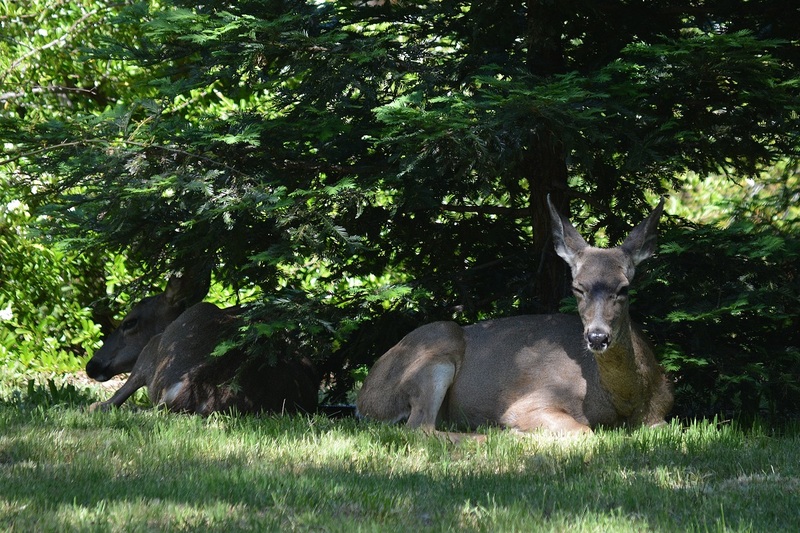 Each afternoon, we’d find them lying in the shade of our redwood trees, napping and chewing their cuds. In early June, the appearance and behavior of both does changed. Based on the swollen condition of their bellies, Kathy and I suspected that the older doe was carrying twins and the younger one would soon give birth to a single fawn. Although we’d hoped they would raise their young in the safety of our three-and-a-half acre wildlife sanctuary, both deer left. 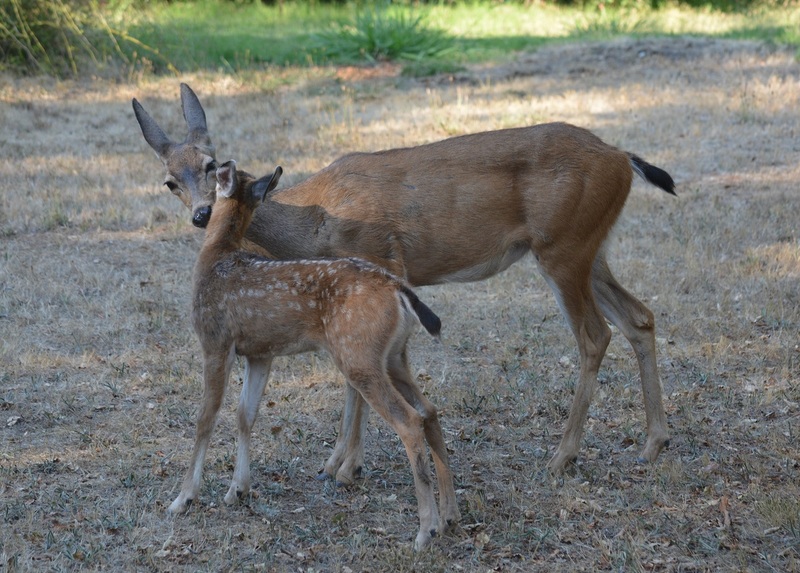 We would not see the older doe again, but her younger companion returned a month later. The doe’s behavior was puzzling: She would feed in our backyard for a while, rest a bit, then disappear into the tall grass blanketing the oak woodland at the back of our property. She repeated this routine for the next several days. Late one evening, just before dark, Kathy and I looked out the back window and saw what we’d been hoping for. The doe came bounding from the woods with a spotted fawn close behind. We were eager for momma to bring her prize closer to the windows, where we could get a better look, but that was not to happen for several more weeks. Instead, she’d lead the fawn out of the tall grass long enough to guzzle from one of the strategically placed water dishes, then quickly return her offspring to the forested hiding place from which they’d come. When the big day finally came and the fawn followed its mother into the backyard, it was covered with foxtails and wild carrot stickers. We were particularly concerned about the fawn’s swollen neck, where a foxtail had migrated under the skin and festered. Like anxious parents, Kathy and I worried about the many challenges fawns face on their precarious journey to adulthood -- none of which we had any control over. Aside from infection, disease, coyotes, and loose dogs, our biggest concern was nearby Deschutes Road, where deer and other animals were regularly run over by speeding cars and trucks. Thankfully, most of our worries were unnecessary. The doe proved to be an attentive mother, grooming her little one constantly and dashing to its aid every time she heard a high-pitched bleat coming from the tall grass. Much to our delight, the stickers were soon gone from the fawn’s coat, and the condition on its neck had healed. In late October, mother and son ran through the yard, bounded the fence like it wasn’t even there, and were gone for several weeks. We thought we would never see them again. Much to our surprise, they showed up in mid-November with a mature buck in tow. Doe and fawn have remained ever since. “Do you think they’ll hang around this time?” said Kathy. “No, they’ll visit for a little while then leave again,” I said. 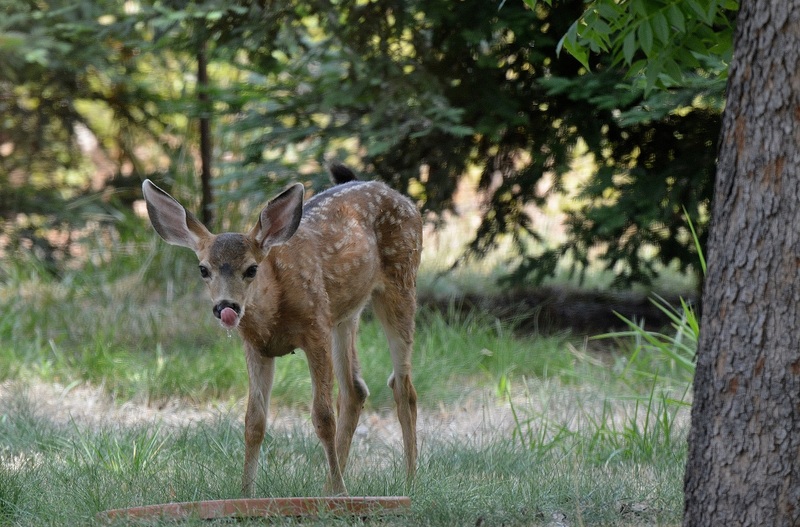 The fawn frequently drank from the containers strategically placed throughout the back and front yards. The doe was always close by and came running anytime she heard a bleat from her offspring. 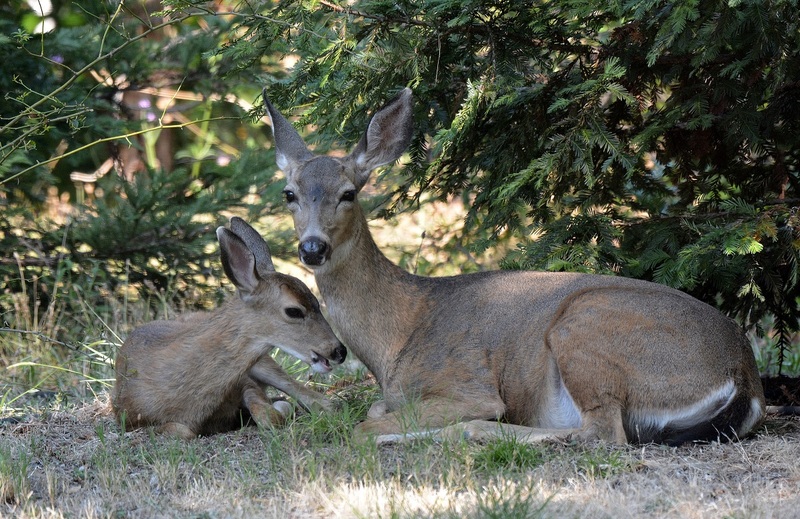 Every afternoon, the two does would rest and chew their cuds in the shade of the redwood trees. I found that once the two does became accustomed to me, they showed little or no fear when I was in the backyard. 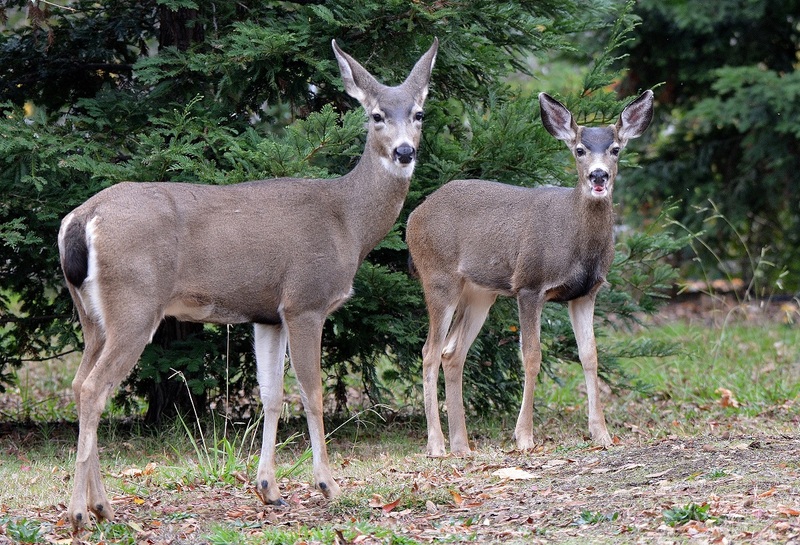 Doe and fawn frequently groomed each other, as part of the bonding process. 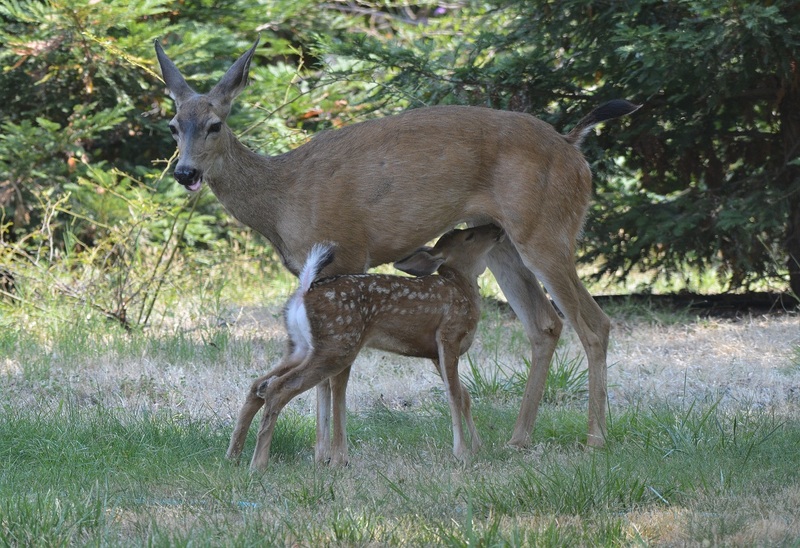 The fawn nursed frequently during his spotted stage. 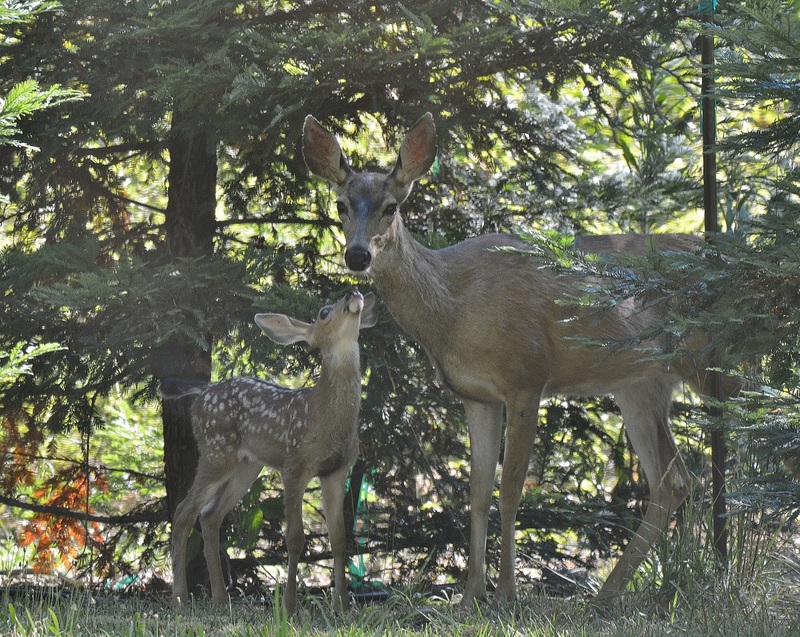 Doe and fawn resting and chewing their cuds in the shade of a redwood tree. These two does arrived in March and remained until June. The slightly larger doe left for good while the other returned and raised her fawn in our backyard. 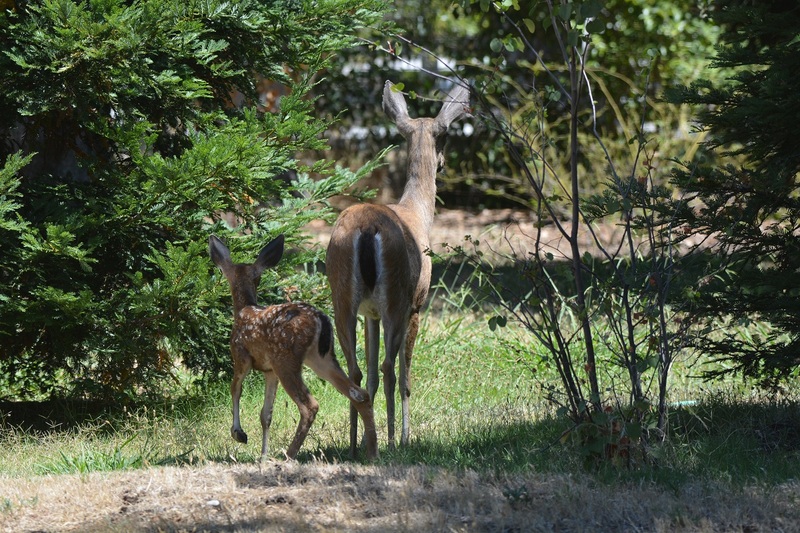 In six months, our tiny spotted fawn grew into a magnificent pre-adult buck, almost as large as his mother. 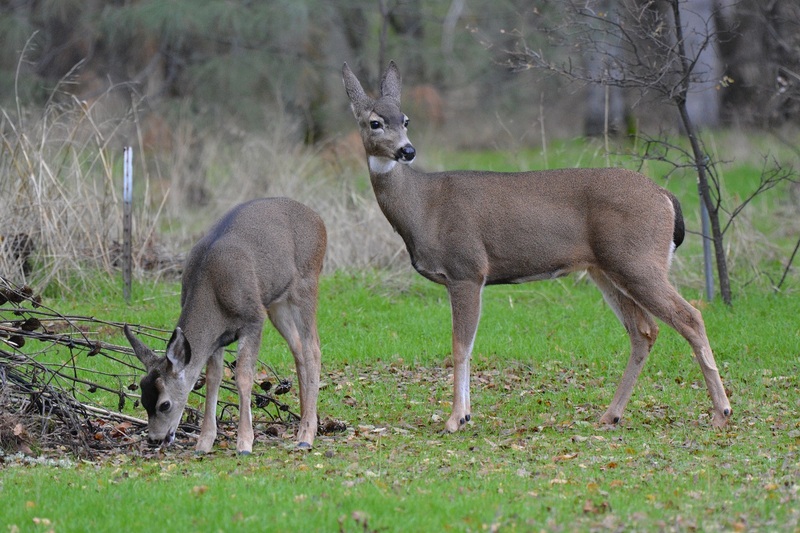 The changing seasons and the availability of acorns brought a change in the doe’s and fawn’s appearance. They grew more muscular, and their coats changed from dull brown to a glossy gray. 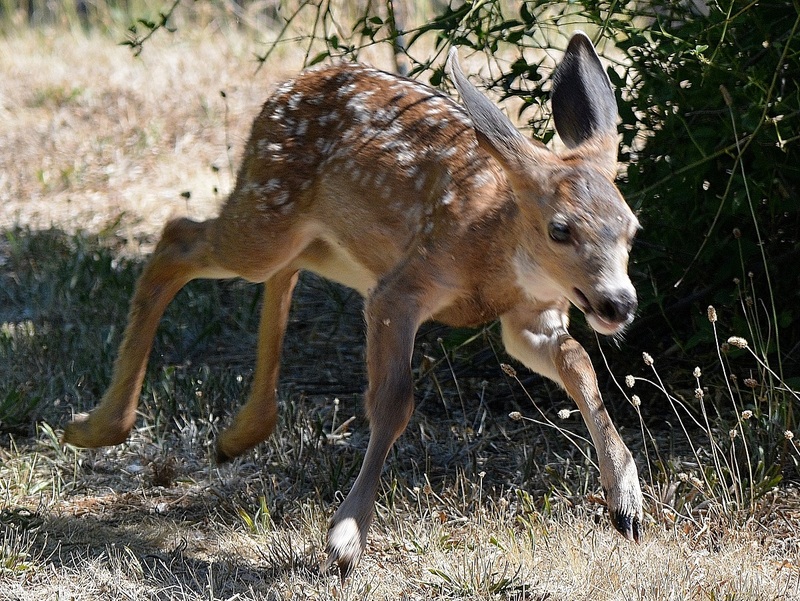 The fawn frequently practiced his running skills by dashing around the backyard. Kathy and I were amazed at how fast he could run.